Yesterday was family day, so if I was going to get anything done this weekend, it would have to be in the shop today. 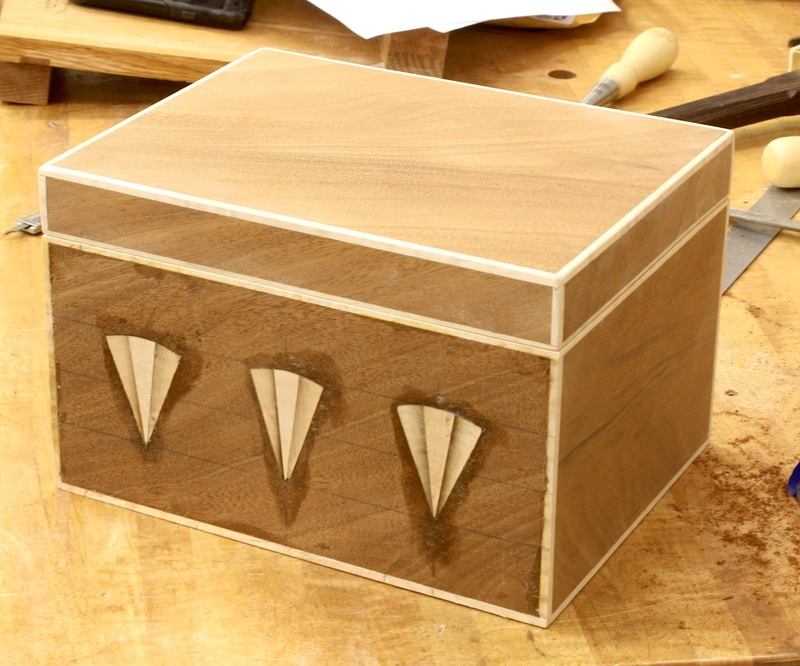 I had a few things to catch up on, and I planned to inlay the box I’m working on. After I fixed a drop finial that was broken off my highboy and reshaped a few brass mallet inserts, I installed hinges on the clock waist doors then got to the box. The first order of business was to make the fans. I decided to make and use fans with three sections instead of the four sections in my original drawings – four sections were too wide for the box front. I sand shaded the fans a little just to provide a hint of visual depth. I then laid the fans onto the box front to arrange a pleasing layout. Once I had the layout set, I traced around the outside of the fans. One thing to remember is to flip the fans as you transfer the layout. Otherwise you could find yourself positioning a fan with its less-desirable face up because sometimes (most times) the fans are not perfectly symmetrical as to allow it. The next step was to waste out the area where the fans fit. 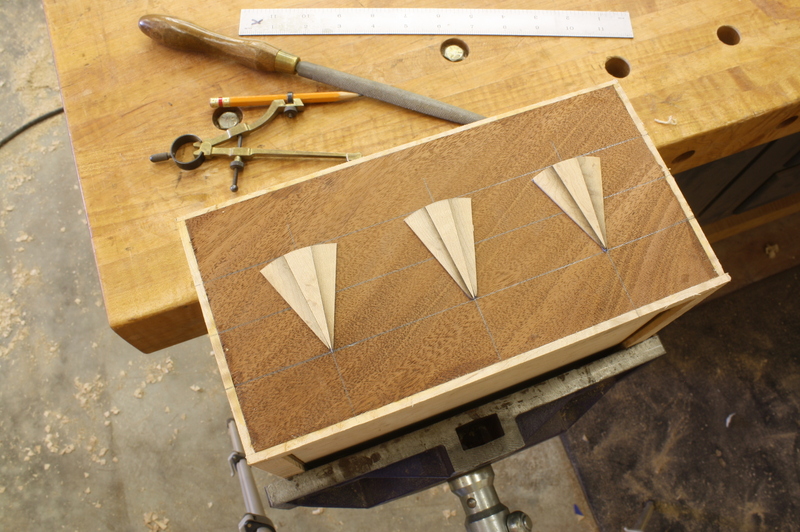 I worked the first fan recess by routing out the waste then setting the lines using my chisels and a #3 carving gouge. On the second recess, I struck the lines then routed away the waste. (I did the third fan recess this way as well, but as far as I can tell, there is little difference. Both methods work equally good. 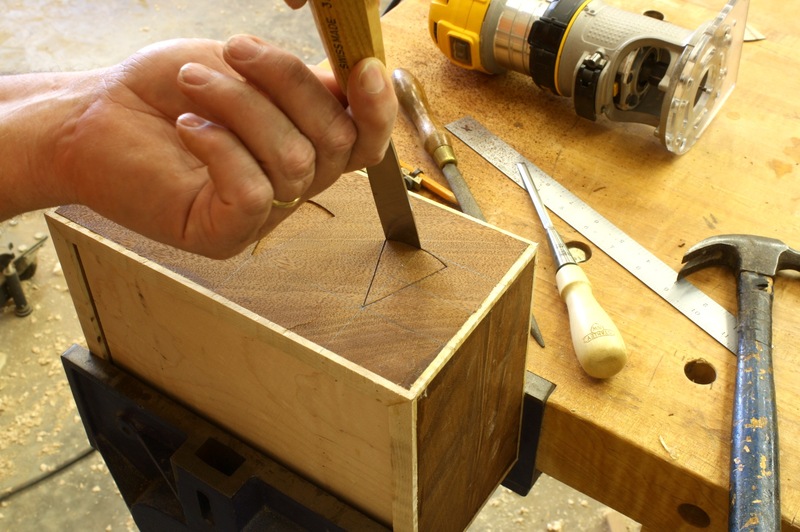 Cut as close to the line as you can without nicking it, then clean away the balance using the chisel. The fans were glued in place using regular yellow glue just before I left for lunch. When I returned about an hour later, I first sanded the top, ends and back of the box to #180 grit. I then peeled the blue tape from each fan. As I looked at the box, I thought it looked a bit plain. 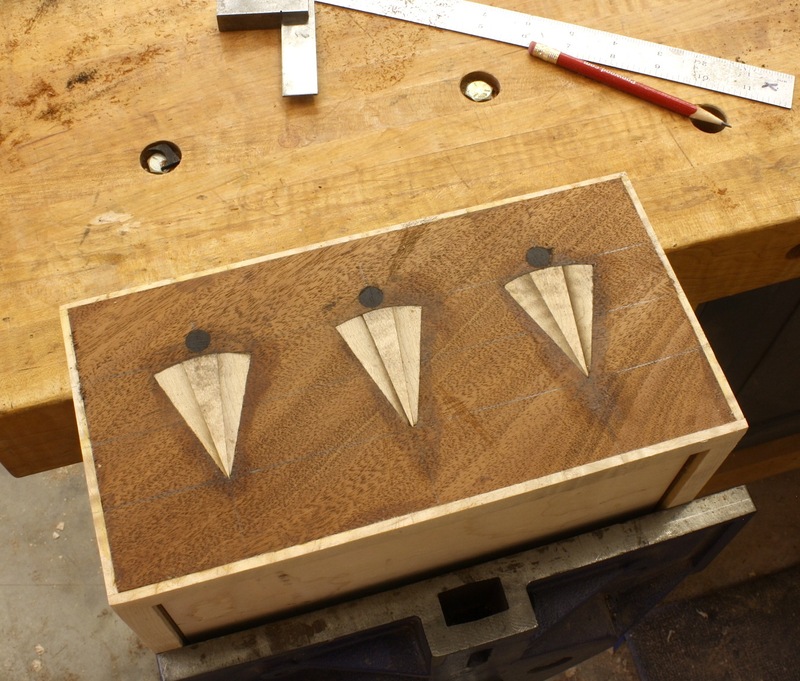 Because I have no set box to create (I’m free-wheeling it), I decided to add another spot of inlay. I settled on a small blackwood dot above each fan. To make the dots, I used a 3/8″ plug cutter then sliced the discs off using a handsaw – that way I could control the thickness of each disc. The recesses for the dots was nothing more than a shallow hole from a Forstner drill bit. Once the holes was cut, I dropped a bit of glue into the hole and set the disc in place. After the glue had enough time to dry and after I had cut, shaped and installed a simple handle in the lid portion of the box, I leveled the front of the box as shown in the opening photo. 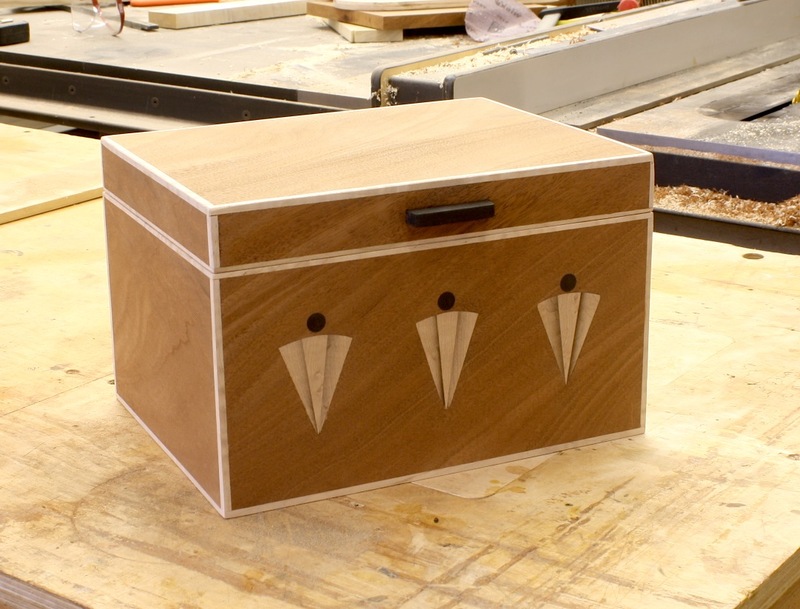 I add a couple hinges during the week, and I hope to use rare-earth magnets to keep the box closed. After that, I’ll apply a few coats of my oil/varnish mixture and that should do it. If I missed anything that you’d like to know, please drop your question in the comment section below. I’ll get you a reply in short order. Did you use a sharp pencil to go around the fans and then cut to the inside of the line? I use a sharp pencil, then try to take half the line. It’s OK to have a bit of space outside the fan; it will fill with glue. But if you’re too tight, then you’re asking for trouble. The fan is difficult to get in and can sometimes work itself up/out as the glue dries. That’s why it’s always good to use a piece of wax paper and clamp a scrap piece over the inlays. Also, make sure you push the fan tight to the substrate. 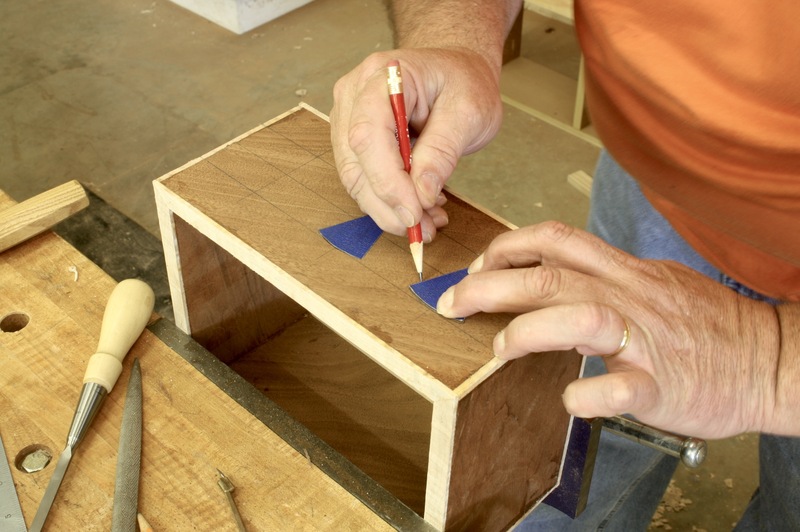 Too much glue – I look for a small amount to seep out as I slip the fan in position – can keep the fan elevated then as you level the surface you can burn through the inlay.